Sharing twin nursery pictures here at our gallery is a fun way to get ideas and inspiration! Designing a room for two babies may raise some unique challenges, so it's helpful to be able to see what other parents have come up with. There are some really cool photos here that are sure to have you feeling creative in no time. Take a look at some really distinctive themes and decorating ideas. 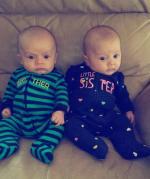 We encourage and appreciate you sharing your one-of-a-kind twin nursery pictures! 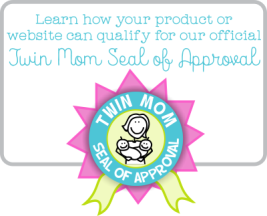 Be sure to visit our page on Planning A Twin Nursery for more help! photos, tips, advice, and ideas! It's a snap...Just fill out the submission form below. We put the boys names over the cribs to help others/family/friends distingush who belongs where and also to help consistency for our boys. Jungle theme for both sexes. Simple, but very boyish and practical. By adding a second bar, we doubled closet space. The boxes are perfect for all of those cute litte necessities, like hats, socks, pacis, and toys.